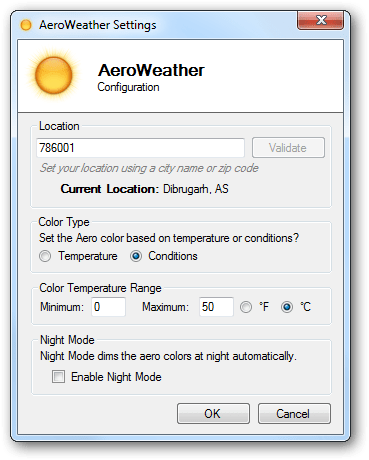 AeroWeather is a free tool that automatically changes the aero color according to your weather. Install the tool and run it. It will sit in the system tray. Click on its icon to show the window. Type your pin code and click Validate. It will now start changing the aero color according to your weather. You can change the option to set the aero color based on temperature or conditions. Enabling the night mode dims the aero color when the sun sets and brightens it when the sun rises the next day.